It’s a big day in the Updyke house. Today, between the hours of 5 and 7pm we will be getting cable! After more than 5 years of rabbit ears, we are going to have not only cable, but also DVR! I don’t even know what to say other than thank goodness for the “win back” program! We are actually paying a dollar less each month than we were for just internet. God bless America. There are a few reasons I am excited about this. First of all, DVR. Love that I will be able to record shows for later. Also, HGTV. I have really missed being able to watch people shop for inappropriately expensive homes and discuss why 4 bathrooms just isn’t enough. Finally, this means we will have Disney Junior! When we were in Florida last month for the Disney Social Media Moms Celebration, I had a chance to attend a meet and greet with the producers of the highly acclaimed Disney Junior show, Doc McStuffins. During this time we saw a couple of episodes and had a Q&A with the producers. Doc McStuffins is a really cute show that helps take some of the fear out of everyday issues that kids often find scary or troubling. Topics like brushing your teeth, going to the doctor and spreading germs are all addressed in a unique way as “Doc” takes care of her stuffed animals who come to life whenever she is around. On the heels of the positive message that Disney is sending to our kids by no longer allowing junk food ads to run during their programming, Disney Junior has announced that Doc McStuffins will be renewed for a second season! And now that we will have cable, I am excited to check it out. As a parent, I feel that it’s my job to teach my children about healthy eating habits and hygiene, but I have to admit that I am really thankful that at least some of the media is taking a stand for health. If you are already a fan and want to get your hands on some goodies, Disney also announced that, based on parents feedback and retail demand, Disney will introduce “Doc McStuffins” books, apparel, party goods and role play toys, dolls and accessories, beginning this summer through early 2013, its quickest to market launch ever for a preschool property. 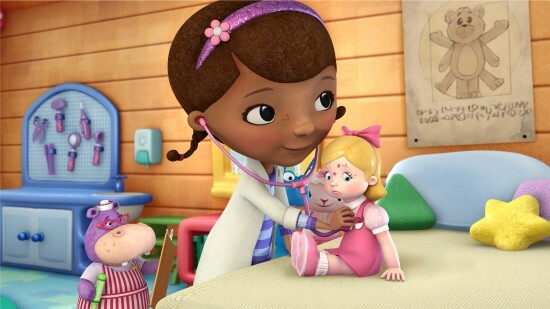 A “Doc McStuffins” DVD will release on August 21. Have you seen this show yet? I’d love to hear your thoughts! For more Disney Social Media Moms recaps, check out these posts! I paid a conference fee to attend the Disney Social Media Moms Celebration at a deeply discounted rate. As a part of this conference, we were provided with complimentary items, special discounts and other benefits such as food and entertainment so that we could experience the magic of Walt Disney World. I was not asked to blog about my experience. All thoughts in this post are my own. Adjusting to life with two kids. Now with more adjusting! Welcome to WDW Event Chats Live! Haven’t seen it yet. But it sounds good. Right now my kids are fine watching Animal Planet, which works for us. Love your Peter Shankman post! My four year old son, Oliver, loves this show. I’m glad there will be a second season. You will love dvr. Such a simple thing. I think the show is adorable. It’s a nice progression from other shows they enjoy: Blue’s Clues, Thomas and Friends and Mickey Mouse Clubhouse. I am more than happy to let them watch this show, and thrilled to hear it’s been renewed!